With global climate change upon us, New York City is already feeling the effects. Rainfall patterns are changing, with more frequent severe storms; the annual mean temperature has risen 3°F in our region since the turn of the 20th century; and coastal areas are becoming increasingly vulnerable to sea level rise. New York, like all cities, will need to be resilient in the face of these new environmental stresses. Resilience can be defined as the capacity to recover quickly from disturbances, and it requires both thought and vigilance. In contrast, resistance refers to the ability to remain unaffected by undesirable events. Resistance to the potential impacts of climate change on our city would be nice, but it is unrealistic, and so we must strive for resilience. The city’s long history of responses to environmental challenges demonstrates its capacity for resilience. During long periods with no obvious threat, inertia can set in, but at critical junctures decision makers have managed to employ innovative solutions. Access to clean drinking water and safe disposal of wastewater have been ongoing challenges, and a brief look at two historical examples provides some insight into what resilience in the face of climate change might look like. During the early years of settlement, the small population at the southern tip of Manhattan drew water from local wells but also dumped sewage and other waste locally, contaminating the environment and eventually their own water supply. There wasn’t enough water to satisfy personal and commercial use and municipal needs such as water for firefighting. In response to a series of devastating fires and deadly epidemics in the early 19th century, New York made a major paradigm shift by following the examples of Philadelphia and Cincinnati in developing a centralized water supply system. Unlike those cities, whose sources were local, New York built reservoirs and piped in water from distant pristine environments. These efforts resulted in the completion of the Croton Water Supply System in 1842, providing a steady flow of clean water to downtown Manhattan from northern Westchester County. This groundbreaking engineering achievement inspired other growing eastern cities, such as Boston, to centralize and expand their water supply infrastructure during the population boom of the mid-19th century. More than a century later, a series of droughts, along with changes to federal regulations, brought a second major shift in the way the city accesses and disposes of water. During the 1980s and 1990s, these droughts coincided with increased water use so that during dry years, natural replenishment of the reservoirs could no longer meet demand. With no realistic prospects to further expand the reservoir system, which had already grown to include the Catskill/Delaware Watershed, conservation and water pricing suddenly, and for the first time, became a central and successful element of New York City’s water management program. Average annual consumption fell by around 30 percent. Around the same time, the city responded to Safe Drinking Water Act amendments by limiting economic development in watershed areas in order to protect water quality. After a series of lawsuits and negotiations, the city worked out an arrangement with communities upstate in which the watershed would essentially be managed as a large green infrastructure project. Rather than building expensive engineering projects like treatment plants, rules were put in place to protect the natural ecological function of forests around the reservoirs to ensure water quality. This agreement also included a more equitable relationship between watershed residents and the city. Moving forward, New York City will need to respond on at least as grand a scale to environmental challenges brought by climate change. Increasing temperatures will further affect our regional hydrology in far-reaching ways. Altered seasonal patterns of evaporation, snow melt, spring runoff, and biological processes in the streams and reservoirs are just a few likely consequences. We don’t know exactly how aspects of climate change will play out yet, but we do know that very real changes to our local environment are on the way, and that they will require major changes in how we think about our infrastructure. For example, more frequent deluges in the city can flood our storm drains and force sewage into the surrounding waterways, a phenomenon known as combined sewer overflow (CSO). The city has already embarked upon a green infrastructure campaign to enhance local ecosystem services to mitigate the worst CSO impacts. Projects include green roofs, bioswales, and rain gardens. Former NYC mayor Mike Bloomberg’s PlaNYC and Mayor Bill de Blasio’s OneNYC provide blueprints for continuing these resiliency efforts. BBG’s Water Conservation Project complements these efforts and provides a model for the public to see how green infrastructure can help manage excess rain. 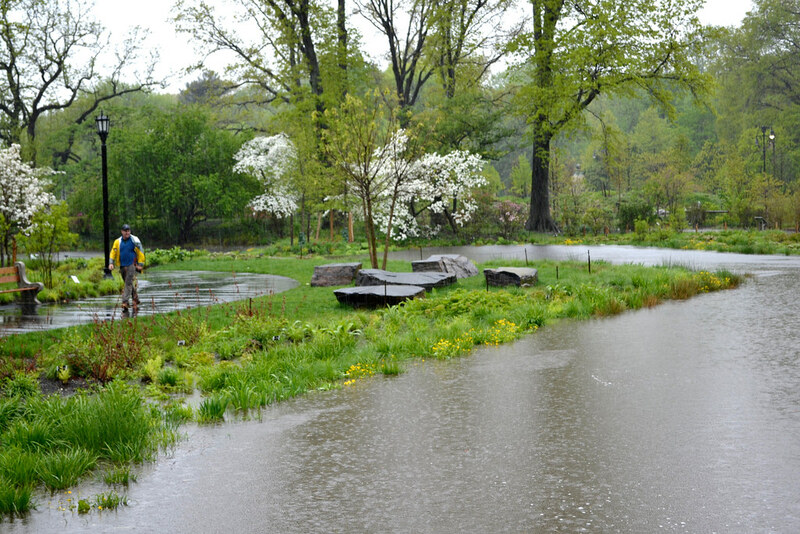 During storms, the Garden grounds absorb rain, allowing water to seep into the stormwater system more slowly and diminishing the magnitude and duration of CSOs. But the Garden’s project, still under construction, actually goes much further. 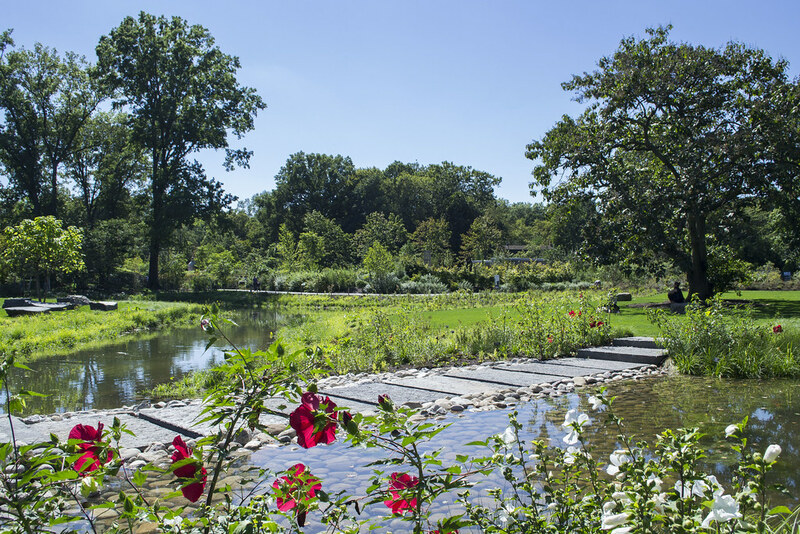 The Water Garden’s pond and brook system, along with a small wetland and riparian environment, promote more rainwater absorption and an even slower flow rate. Its plants include species chosen for their ability to absorb water and filter contaminants. A rock and soil weir filters water and regulates pond depth. An automated system triggers the pond to drain in advance of wet weather so that it can hold extra rainwater and minimize peak flooding. This has already reduced BBG’s annual wet-weather burden on the city’s stormwater system from 8 million gallons to only 2ó million gallons. When the project is completed this year, an underground pump system will recirculate water back uphill to the Japanese Hill-and-Pond Garden. The Garden’s freshwater consumption for outdoor features will ultimately drop from 22 million gallons a year to less than 1 million. These sorts of projects provide a wonderful opportunity to promote the understanding of sustainable water practices. In the face of uncertainty about how climate change will affect us locally, it is becoming ever more crucial to appreciate resilience and promote practices that will serve us for decades to come. Cities across the world have assumed leadership roles in these efforts, with New York City at the forefront. It’s exciting to see Brooklyn Botanic Garden part of that transformative effort. You may have heard some of this advice before, or it may be new to you. Either way, consider putting these strategies into practice now. Install WaterSense–labeled fixtures like shower heads, faucets, and toilets. These meet the EPA’s specifications for water efficiency. WaterSense appliances are also available. Find leaks and fix them. Plant drought-tolerant species in your garden. During a storm, hold off on doing laundry or dishes or showering so that you don’t add wastewater to the deluge. Waiting even just a few minutes until the initial surge has passed can make a difference. Be a gardener. Any garden, even a container garden, will help absorb excess rainwater and reduce runoff. 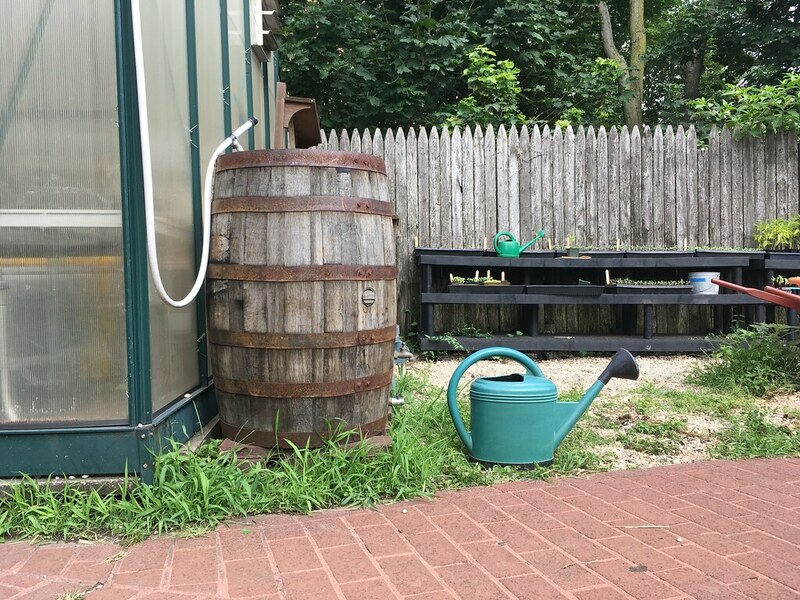 Obtain a rain barrel to collect rain and use it to water your plants. If there is a city bioswale (curbside rain garden or specially designed tree bed) near your home, keep it clear of litter, and stay tuned for city-led workshops for other stewardship efforts. The Stormwater Infrastructure Matters coalition (SWIM, swimmablenyc.org) provides information and activities to promote sustainable storm-water management around New York City. Calculate your water footprint using the calculator created by Grace Communications Foundation (watercalculator.org). Read Eat Less Water, by award-winning author Florencia Ramirez. The book provides an informative overview of the connection between food consumption and water use and offers tips and recipes to minimize that impact. Allan Frei and William Solecki Allan Frei is a professor specializing in climatology in the Department of Geography, Hunter College, City University of New York; and the CUNY Institute for Sustainable Cities. William Solecki is founder and director emeritus of the CUNY Institute for Sustainable Cities at Hunter College. Rain falling in BBG's Water Garden. Photo by Blanca Begert. 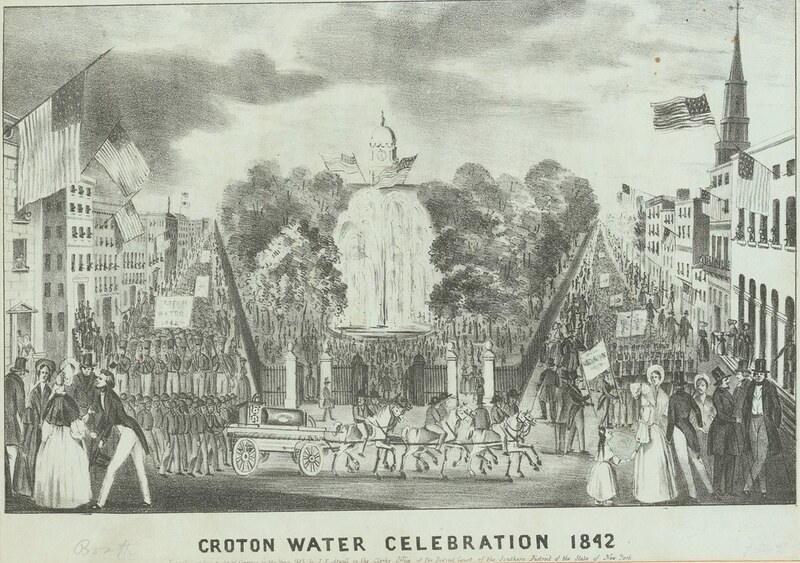 When the Croton Water Supply System was completed in 1842, it was cause for great celebration in New York City. Church bells rang, parades were held, and fountains were turned on to commemorate this monumental achievement. Illustration courtesty of New York Public Library. 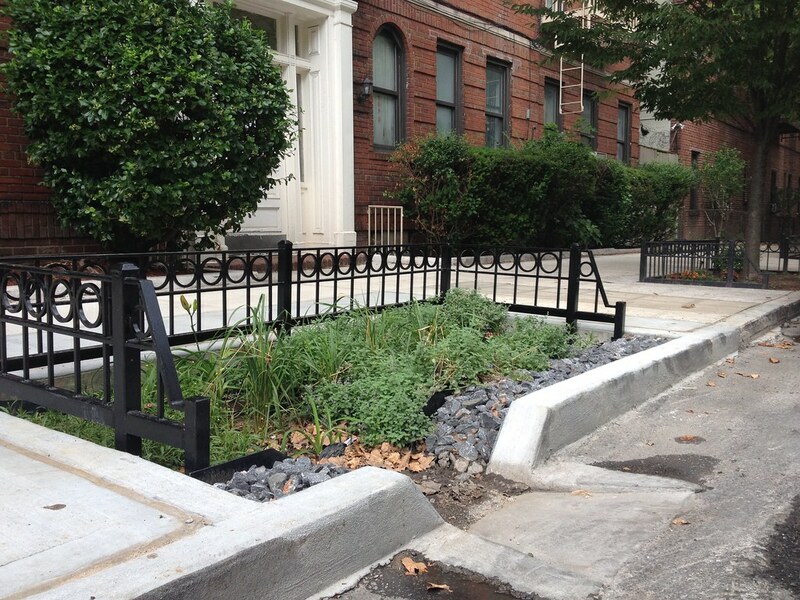 A curbside raingarde, or bioswale, installed by the city as part of a greater effort to reduce combined sewer overflows. Photo by Sarah Schmidt. 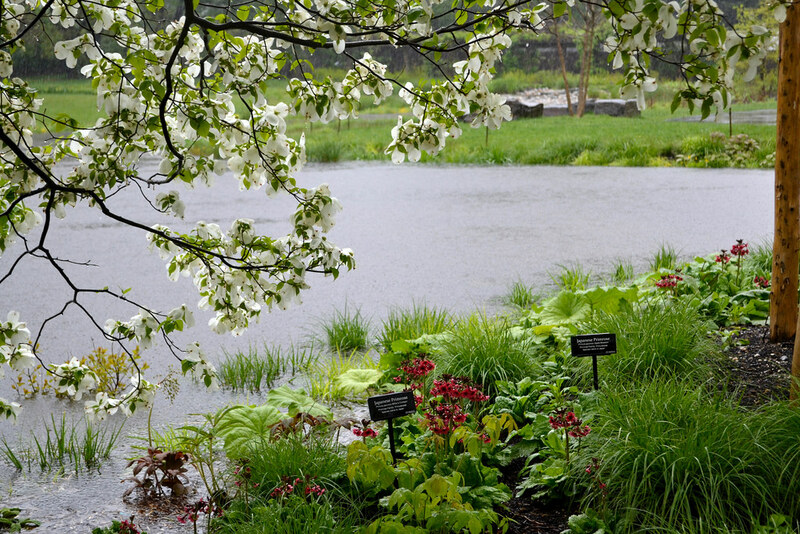 Rain falling in the Water Garden. Photo by Blanca Begert. 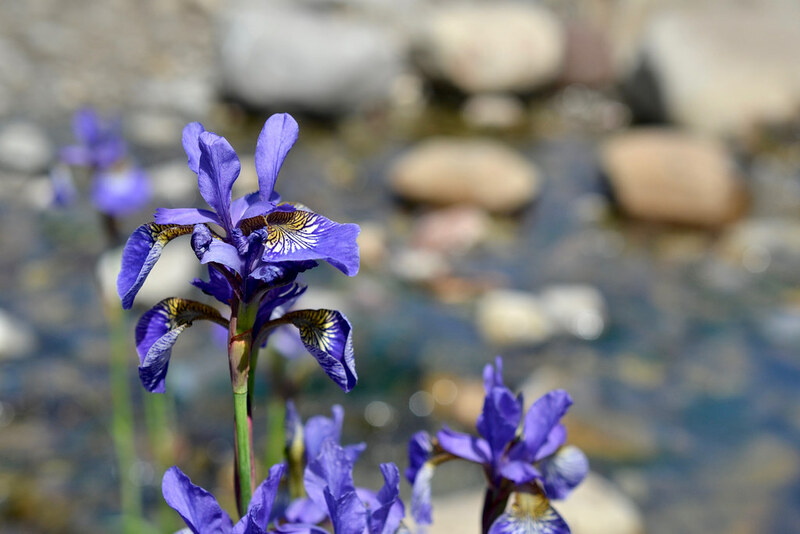 Iris sibirica 'Caesar's Brother' (Siberian iris) in the Water Garden. Photo by Blanca Begert.